The distance may vary based on the size or position of the window. If the window detects the resistance while the power window switch is pulled up continuously, the window will stop upward movement then lower approximately 1 in. (2.5 cm). And if the power window switch is pulled up continuously again within 5 seconds after the window is lowered by the automatic window reversal feature, the automatic window reversal will not operate. Always check for obstructions before raising any window to avoid injuries or vehicle damage. If an object less than 4 mm (0.16 in.) in diameter is caught between the window glass and the upper window channel, the automatic reverse window may not detect the resistance and will not stop and reverse direction. The driver can disable the power window switches on the passenger doors by pressing the power window lock button located on the driver’s door to the LOCK position (pressed). 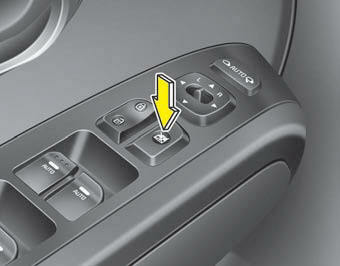 When the power window lock switch is pressed : - The driver's master control can operate all the power windows. - The front passenger's control can operate the front passenger's power window. 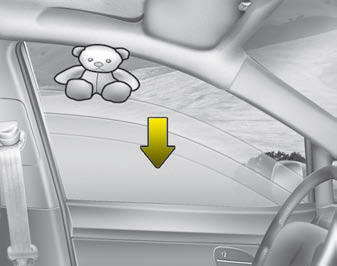 - The rear passenger's control cannot operate the rear passenger's power window. Never try to operate the main switch on the driver's door and the individual door window switch in the opposite directions at the same time. If this is done, the window will stop and cannot be opened or closed. Never leave the keys in your vehicle with unsupervised children, when the engine is running. NEVER leave any child unattended in the vehicle. Even very young children may inadvertently cause the vehicle to move, entangle themselves in the windows, or otherwise injure themselves or others. Do not allow children to play with the power windows. Keep the driver’s door power window lock button in the LOCK position (pressed). Serious injury can result from unintentional window operation by the child. Do not extend heads or any limbs outside the window while the vehicle is in motion.